Properly stashed the figures and trees of this nativity fit the beautiful lacquered box. Nomads of East and West used to travel taking with them all their valuable possessions, not least those which gave them a sense of identity and belonging. And so the box had to live up to its content — the portable altar and the cherished family memorabilia. The box became an artwork in itself. Wherever the nomads settled, if only for a short time, out of the box came the Lares and Penates of their religion. This nativity from Nepal is a Christian treasure box. It shows Joseph with open palms facing Baby Jesus: a sign of respect in Nepali culture. One shepherd holds in his hands a feather, sign of learning; a staff to symbolize hard work. The other shepherd holds a sword in his hand, ready to defend livelihood and culture. 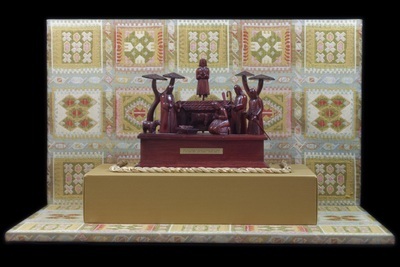 Handcarved wood box and figurines depicting the nativity of Jesus, created by Narayan Shilpakar in Nepal in 2005. Exhibition label originally written by Fr. Johann G. Roten, S.M. for exhibit held at Roesch Library, University of Dayton.